Here are 25+ inviting alphabet activities with my all-time favorite alphabet beads! You may have seen them floating around Pinterest or on Facebook, and I am glad that I am not the only educator and mom who loves to throw them into activities on a regular basis! My children and I have “ooohed” and “ahhhhed” at so many activities that some of my favorite bloggers have made with them, so I was thrilled to put all of these incredible activities together! You’ll see our own favorite ideas too! 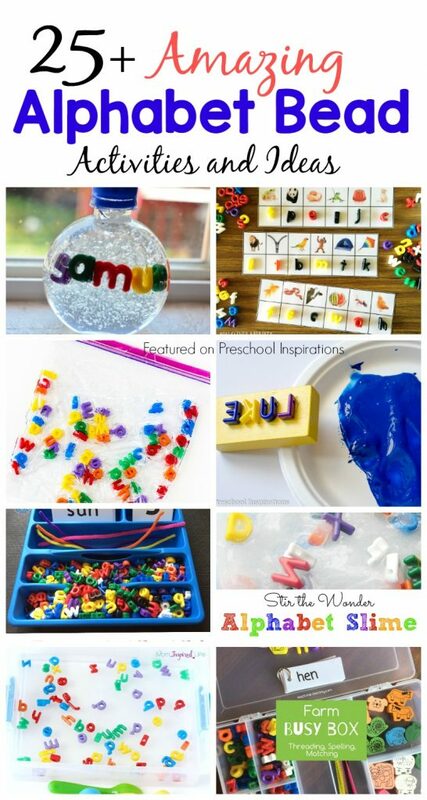 Not only are these alphabet activities inviting, but they are also very effective for helping children to find letters meaningful! One day I set out a bin of the letter beads on the table for the children to handle and just openly play with. After some time, I noticed one of my students making sounds with the letters. I listened in closer. And I was completely shocked with what I heard. This three-year-old had been keeping a secret that the letter beads opened a key to. It was a key to me, of course. Not him. My student was picking up the letter beads and saying the sounds of each of the letters and arranging them uniquely on the table. Before this day, I had never heard him say the letter sounds. I knew he was intelligent, but I had no idea what his true abilities were. This is only one example of so many others that come to mind! One of the aspects that I love about these letter beads is that children can feel and see the shape of each letter. They are gaining so many benefits from handling alphabet beads (and many other types of alphabet manipulatives) and moving them around. In fact, Dr. Maria Montessori invented one of the first forms of a movable alphabet, and it is still being used today because of the immense benefits to reading, writing, and literacy in general. Children begin to figure out which direction to put the letter, which letters are in their names or the names of a loved one, which sound some of the letters make, and so many more important skills that are giving them confidence and hands-on interaction with the alphabet! Where is the Best Place to Buy Alphabet Beads? There are two places that I have purchased these: Amazon and Discount School Supply. Amazon has them in upper case, lower case, and even numbers and math equations. I bought one set from Amazon because there was free shipping for Prime Members. Discount School Supply has them available in upper case and lower case. I only buy them when I am putting in a big Discount School Supply order and already getting free shipping. If you want both sets, but only one is in the budget, I would recommend starting with lower case. There are just under 300 beads of the lower case, and there are 300 beads in the upper case beads, which makes them great for both the classroom or at home! 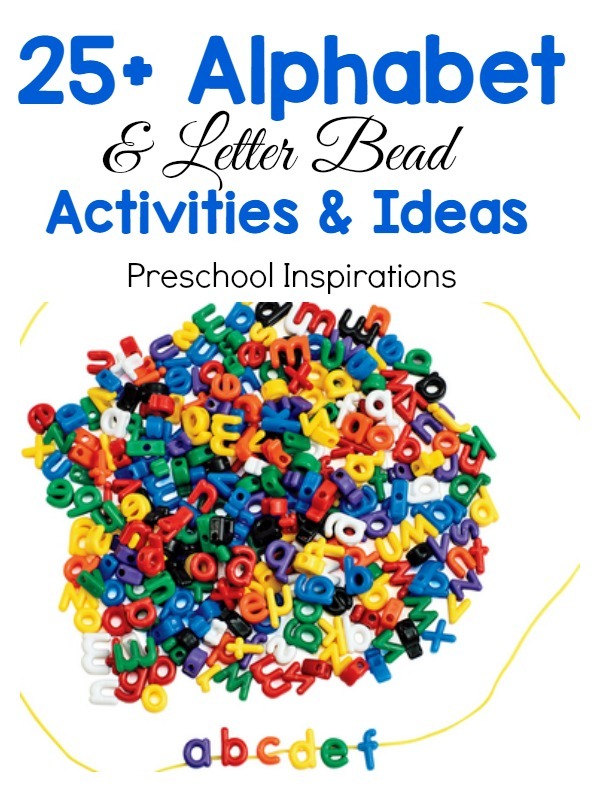 Here are some of the best alphabet bead and letter bead activities. Some are great for preschool and others for older children. These alphabet bead activities are hands-down on of my favorite teaching tools ever, and I can’t wait to come up with more and more ways to use them!